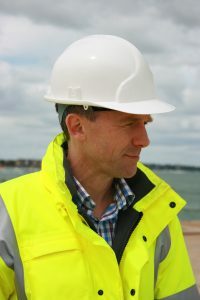 Hi, I’m Philip Wise, DIO’s Principal Project Manager for the work taking place at Portsmouth to ready the naval base to be home port of the Royal Navy’s two new aircraft carriers. The first, HMS Queen Elizabeth, is planned to arrive early next year and will be followed by sister ship HMS Prince of Wales in due course. The aircraft carriers and the F-35B fighters they will carry will be a vital part of Britain’s national security and will help the Royal Navy to play their part in protecting the country and project global British influence. We’ve been keeping you updated on progress on the project through this blog, including the substation and jetty works and it’s time for another update. 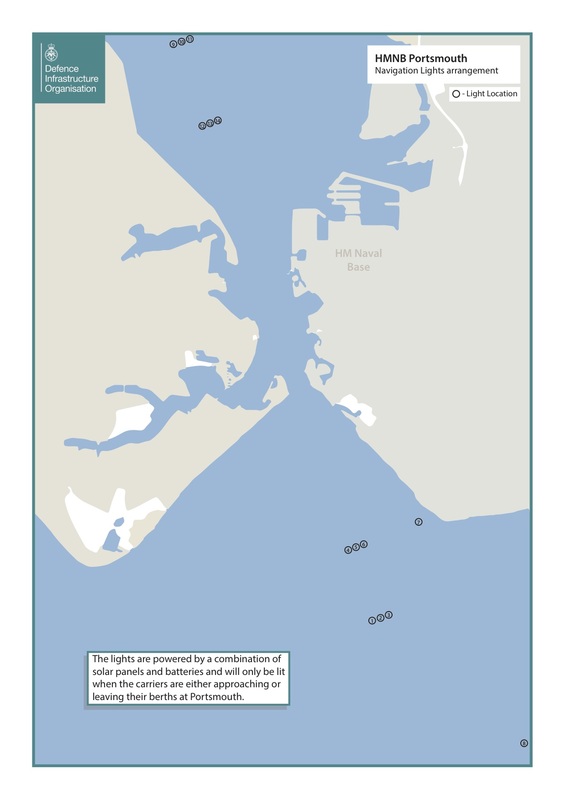 We’re installing navigation lights on the approach to Portsmouth harbour and particularly to guide the vessel through the narrow harbour entrance. The navigation lights are mounted on top of 14 large steel tower structures rising up to 30 metres from the sea bed. 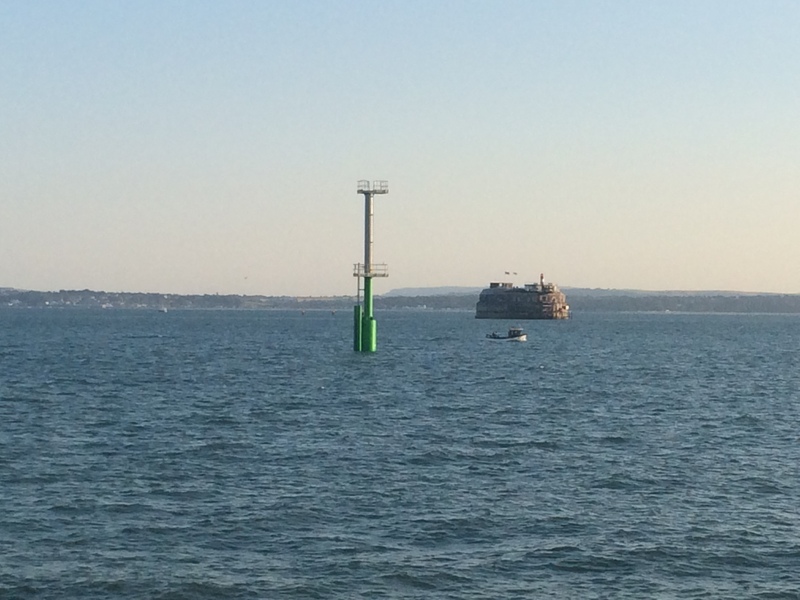 Once operational the lights will enable the pilots to safely navigate in and out of Portsmouth harbour by providing a visual check on the vessel’s course. Earlier in the year our contractor, VolkerStevin, drove the pile foundations into the sea bed and are now putting the upper sections in place. The lights are powered by both solar panels and batteries so they will work whatever the weather. To minimise distraction to other vessels and local people, they will only be lit when the carriers are approaching or leaving their berths. They each weigh around 22 tonnes and we have been using a 350 tonne crane barge to lift them into position. Getting them in place has required close liaison between ourselves, VolkerStevin, the Queen’s Harbour Master, ferry operators and the like. Portsmouth is a busy harbour for both civilian and military vessels so it was important to have these discussions to make sure the work could take place safely and with the minimum disruption to other harbour users. 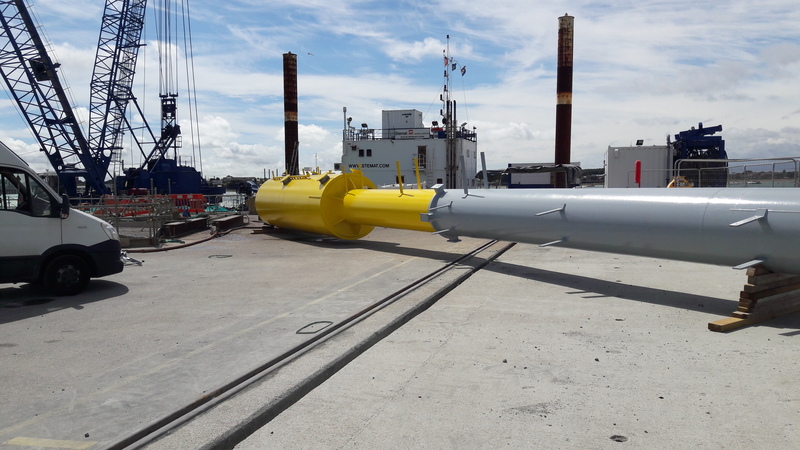 The navigation light towers are being installed as part of a £34 million package of infrastructure work being delivered on behalf of DIO by VolkerStevin. The approach channel and berth pocket in which the aircraft carriers will be moored is being dredged by Boskalis Westminster Ltd to ensure they are deep and wide enough for ships the size of HMS Queen Elizabeth and HMS Prince of Wales, which are the largest ships ever operated by the Royal Navy. Sorry but I have to say that the new navigation marks are incredibly ugly. Utilitarian metalwork like that would look perfectly at home in the middle of an oil refinery, but just off a tourist beach I think you should have made an effort to come up with something more elegant. I absolutely agree, David. I am frequently in and out of Portsmouth and I am really sad no one has taken any effort at all to meet these utilitarian structures even mildly attractive. Where has the spirit of our Victorian (and earlier) engineers, such as Stevenson, Brunel and Smeaton, gone? And as David says, with a backdrop of historic Old Portsmouth. As we know, good design need not add a penny to the budget. Another lost opportunity. Will there be any lights on them to help yachts and small vessels that approach the harbour outside the channel to identify their location at night? Hi Greg, thanks for reading. Yes, they do have lights. Why are they placed in this pattern. ?..are some of them transits? Why are there 2 rows of 3 for example? Mike, sorry for the delay - your comment was missed unfortunately. The three towers (triple transit lights) align with the vessel's port, centre and starboard lines so it can be aligned with the entry channel. Where can I find out how these new nav lights work? I'm a retired Master Mariner and would love to know more. Why are there 3 lights in each group? How will th lights be used ? Harry, sorry for the delay - your comment was missed unfortunately. David, sorry for the delay - your comment was missed unfortunately. Why do they need to be in a row of 3 ? Joseph, sorry for the delay - your comment was missed unfortunately. To provide navigational certainty the vessel’s navigator visually aligns one set of three up with the other (i.e. they act as a pair) and because each of the three lights is a different colour the navigator can be certain he’s lining up the correct lights. The most critical element of the navigation into Portsmouth is passing through the narrow harbour entrance. We have pairs of triple transits in both the outer and inner harbour to guide the carrier either way through the entrance. Could you explain why some of the marks occur in threes? Sorry for the delay - your comment was missed unfortunately. Thanks i understand the 12 lights - do the other 2 navigation marks have a role as well? "the navigation lights are mounted on top of 14 large steel tower structures rising up to 30 metres from the sea bed"
Hi Chris, The 12 lights are divided into four sets of three (hence triple transits). To provide navigational certainty the vessel’s navigator visually aligns one set of three up with the other (i.e. they act as a pair) and because each of the three lights is a different colour the navigator can be certain he’s lining up the correct lights. The other two lights on piles provide visual control for directional changes either before or after passing through the harbour entrance, dependent on direction of travel. These are single lights rather than triple transits. Hi Terry, The 12 lights are divided into four sets of three (hence triple transits). To provide navigational certainty the vessel’s navigator visually aligns one set of three up with the other (i.e. they act as a pair) and because each of the three lights is a different colour the navigator can be certain he’s lining up the correct lights. waiting to see how these carriers turn in the harbour (without huge lights on towers) - maybe employ a few brittany ferry pilots..
hi there....looking at the picture with the tower on the pier next to the transit van, the base doesn't look too long ( could be perspective). I've seen these in the Solent and the water comes half way up the base. I was wondering how deep the water is where these have been installed? I thought the Solent was deeper than that. So there is the Queen Elizabeth, next Thursday perhaps, with the port light lined up with the port line, the centre light with the centre line, and the starboard light lined up with the starboard line. After the Queen Elizabeth has run down the centre light, how is it going to leave port safely with only sets of 2 lights remaining? Your explanation might be self-explanatory to you, because you know the system, but it doesn't mean anything useful (in spite of many repetitions) to a landlubber. As Mr/Ms Skynner suggest, how about a diagram? The 12 lights are divided into four sets of three (hence triple transits). To provide navigational certainty the vessel’s navigator visually aligns one set of three up with the other (i.e. they act as a pair) and because each of the three lights is a different colour the navigator can be certain he or she is lining up the correct lights. Hi Simon. Helen Pickering's explanation is clear but I wondered the same thing initially - how the ships would use the transits without running them down. Then the answer came to me. The Carrier's Commander would line up the transits in the inner harbour when entering and those outside the harbour when leaving - I think ? Helen, please let us know if this is correct. That sounds right - they use the pair in the inner harbour for entry, and the pair in the outer harbour when leaving, and align them with the lights on the ship. Thanks Helen. I often come in and out of Portsmouth (in my little sail boat). It is now clearer to me how these new marks will be used by the big boys. Giving this further thought, the outer ones could be kept in transit astern when entering, with the inner ones in transit ahead thus giving even more certainty to the Commander that he is in the centre of the channel. The opposite when leaving of course. Keith. Your idea would not work because the carrier's bridge is offset to starboard from her centreline/keel. So, the ‘in’ transits (up harbour) are aligned slightly to the east of the middle of the entrance; the ‘out’ transits (near Spitsand Fort) are aligned to the west. As for being certain that the ship is on track at this critical phase, the lights are very bright and very accurate! Surely a simple red- white- green beamed light system, as I installed at the entrance to the Hamble would work equally well and perhaps not cost millions for some defence company to profit from, let alone the ongoing maintenance cost. They look awful stuck out in the Solent. Turned a lovely view into an industrial estate scene.